Lori is located on Armenia's northern border, the largest in area of Armenia's eleven regions. Bounded on all sides by rugged mountains and cut by sheer gorges, Lori is a dramatically beautiful region, sparsely settled except for the valleys of the Pambak, Debed and Dzoraget rivers. Apart from richly furnished tombs, the early history of the region is little documented, but its medieval monuments are an interesting fusion of Georgian and Armenian, Georgian dominant politically, Armenian culturally. Bone of contention between the King (in Persian eyes a vassal Vali) of Georgia and the Khan of Yerevan during the 18th century, this region was incorporated into the Russian Empire in September 1801 as part of Russia's annexation of Georgia. Until 1918, Lori N of the Pushkin pass was part of the Borchalu region of Tbilisi Gubernia, considered part of Georgia despite its mixed Armenian, Azeri, Russian, Greek, and Georgian population. In a short, sharp war over New Years 1919, a war both Georgians and Armenians deprecated, Armenian troops under their famous war leader Dro pushed N up the Debed river along the railroad, capturing Sadakhlo and beyond. The British military mission in Batumi intervened to broker a cease-fire and partial troop withdrawal, with the modern Georgia-Armenia border one consequence. Lori's more modern history is shaped by the terrible earthquake of December 7, 1988, centered on the eastern Lori village of Shirakamut. This disaster (best known for the havoc it wrought in Gyumri) destroyed the city of Spitak, damaged Vanadzor (Kirovakan) and Stepanavan, and left scars it will take generations to heal. Lori is home to Haghpat and Kober monasteries -- two of Armenia's loveliest -- and a host of other important medieval monuments, to the spectacularly sited Lori Castle (Lori Berd), to a pleasing Arboretum in Gyulagarak, and to a range of stunning landscapes. Though lacking a major resort destination, Lori's importance as a transport corridor to Georgia has contributed to the development of a growing number of small hotels and restaurants on the main routes N.
Approaching Spitak from the South from Aparan via the 2153 m Pambak Pass, you pass on your right hand Saramej (83 p, till 1946 Chotur, church of 1906), with Jrashen (1119 p, till 1940 Vordnav, 19th c. church) on the left and, further W, Lernavan (1109 p, till 1946 Ghachaghan). This latter has the ruined settlement of Kharabak 2 km W, and a 19th c. church in the village. On the outskirts of Spitak (388 p, till 1949 Hamamlu) you see various housing projects built by the international community to shelter the thousands made homeless by the December 1988 earthquake. On the hill where most of the earthquake victims were buried, often with an etching of the victim on his tombstone, is a tin church, built as a monument to the estimated 4000 killed in Spitak. There is a new, ornate church just off the road and a semi-adequate hotel reached by turning left after the new Cultural Center and before the descent to the railroad tracks. From Spitak, a road leads S up the mountain to Lernantsk (870 p, till 1950 Spitak, with S. Minas Church of 1910), whence a disused road climbs to the 2378m Spitak pass. North of Spitak is Arevashogh (241 p, till 1978 Zigdamal, 19th c. church, ruined fortress nearby). The map shows a bad dirt road continuing N from Arevashogh 33 km to Urasar and Stepanavan, but locals are highly skeptical that it is passible. East on the main road to Vanadzor, following the Pambak river and the railroad, you pass the turnoffs for Karadzor (4757 p, founded 1836); Ghursal (639 p) with a ruined 7th c. church of S. Gevorg, and Nor Khachakap (438 p, formerly Saral); and Lernapat (415 p, Hajighara till 1946, then Makarashen till 1959), situated in a beautiful mountain valley. It preserves a neglected basilica of 1868 and has an Early Iron Age fortress on a nearby hill. The right/lower fork continues to Halavar (0 p), once occupied by Azeris but now home to a small population of refugees from Azerbaijan. N of the main road, Arjut (2453 p) has a ruined mosque; Darpas (1162 p). Just before entering Vanadzor, near a cluster of high-rise apartments, a side road takes off north, signposted for Stepanavan. Passing a military base, you reach the village of Bazum (226 p, till 1978 Bezobdal), with Berdatagh ruined fort on a hill 1.5 km NE. W is Aznvadzor (587 p, till 1940 Khanjughaz, then Gyuzeldara, Azeri until 1988). Passing through a long, dark tunnel (which avoids the once deadly 2037 m Pushkin pass), you emerge into a part of Armenia incorporated in Russian imperial times into the Georgian district of Borchalu. There is an excellent roadside khorovats stand among pretty woods. Beyond, Gargar (1096 p, formerly Gerger Hay -- "Armenian Gerger") has a ruined church and S. Amenaprkich shrine. Off to the W is Pushkino (207 p, till 1937 Gerger Rus, a Russian village); the main road passes Gyulagarak (see below), and Amrakits (127 p, formerly Kirov), this latter with a little Russian Church of the 19th c., and a motel ($20/night, hot water) on the Stepanavan side. Just after the motel, look right across the gorge to see the ruins of Lori Berd, which can be reached by traveling about 4km past the Stepanavan bridge, keeping to the right at all intersections. The city and former regional capital of Stepanavan (1287 p, till 1923 Jalaloghlu) is located on a dramatic green plateau beside the remarkable gorge of the Dzoraget river. There are two pensionats SW of town on the edge of the forest, the Vahagn and the Anahit, which accept overnight visitors (No hot water but the price is right). About 150 m SW of the main traffic circle (with huge statue of the town's namesake, the famous Baku revolutionary martyr Stepan Shahumian) is a modern bright orange tuff cultural center housing a museum to Shahumian. A ruined 5-6th c. church has disappeared, but there is an 11th c restored functioning basilica church E of the main Vanadzor-Tashir road about 0.5 km S of the circle. Turning right at the back corner of the cultural center, a bumpy road leads W up hill to (3 km) an attractive shrine/picnic site overlooking the city, and then to the villages of Armenis and Urasar (0 p, formerly Kuybishev, renamed for the 2992 m Mt. Urasar). The road continues up and over to Katnaghbyur (526 p, till 1935 Ghotughbulagh), which has a cold spring considered a sacred spot since antiquity. Turning E in the village of Gyulagarak (210 p) (about 10km prior to Stepanavan), the road passes a ruined church of 1874. Shortly after, the main road turns left while a poor paved road leaning to the right passes South toward the hills, passing the much rebuilt ruined 6th c. Tormak church and a khorovats restaurant to end at a sanatorium and the gates of the "DendroPark"* =45= (40 56.17n x 044 28.85e). This splendid botanical garden, covering 35 hectares, was founded in 1931 to collect, study and acclimatize to Armenian conditions useful trees and other plants. Kept in excellent condition by its director, the son of the founder (buried on the site), Dendropark is a cool and beautiful sanctuary unlike anywhere else in Armenia. Continuing E from Gyularak parallel to the Gargar River, Hobardzi (287 p) is reported to have a ruined 6th c. single-aisle church. Toward the E end of Vardablur (363 p), a muddy road leads N across the fields to the impressive gorge of the Dzoraget River and to the ruined 6/7th c. Jgrashen church on the edge. Entering Kurtan (107 p) from the West, you pass a small ruined single-aisle church. The main road then angles right to cross the stream. Keeping straight on toward the village, you pass a number of large official buildings and then, on the left, after a large schoolyard and fountain, reach the ethnographic museum, open 11-5. A bit beyond is a partially restored S. Astvatsatsin single-aisle basilica, allegedly of the 5th c. Back on the main road, a right turn on a dirt road leads to Antaramut (309 p, till 1948 Kolageran), with a ruined church and various unobtrusive bore holes dug by the U.S. Geological Survey in 1998 for a joint U.S.-Armenian coal exploration project. The paved road from Kurtan gradually descends E along the side of the gorge, heading toward the Debed river. At 6.3 km from the Kurtan intersection, after a series of switchbacks, you reach a spring, monument and picnic table, from which spot a rough track descends to Hnevank* =75= (40 57.17n x 044 35.18e) on a hill inside the dramatically beautiful gorge, near where the Dzoraget and Gargar rivers join. This splendid monastery, decorated with fine stone carving, was built originally in the 7th c., but totally rebuilt by lord Smbat of the then Georgian but later Armenian Orbeli/Orbelian family, ancestor of the Armenian princes of Syunik, in 1144, as a Georgian inscription around the drum attests. There is a gavit of 1186-1206, and several impressive service buildings rise out of the tall grass. It is likely that this was the monastery known by 13th century historians and scribes as Pghndzahank ("Coppermine"), presumably from some miracle worked at the mines nearby, though other sources believe that Pghndzahank/Phghndzavank was Akhtala. According to Kirakos Gandzaketsi, Atabek Ivane Zakarian took this monastery from the Armenian church and made it a Georgian/Chalcedonian monastery. The remains of both Ivane and his son Avag were brought here to be buried. Stepanos Orbelian recounts how a precious relic of the True Cross, appropriated by Atabek Ivane and stashed in Pghndzahank, was ransomed back for 1000 gold dahekans by Libarit Orbelian and brought back to Noravank after it had miraculously caused the surrender of the fortress of Charek (now in Azerbaijan). Hnevank's Georgian name reportedly translates to "True Cross," perhaps an echo of the story. The 13th c. priest and scribe Simeon, two of whose manuscripts survive, copied in the Pghndzahank scriptorium a work of Gregory of Nyssa and translated from Georgian to Armenian a theological tract of the Neoplatonist Proclus. His colophons confirm that Pghndzahank was a Georgian monastery near Lori (indeed only a few km W). About 1.5 km beyond Hnevank, a deteriorated dirt road cuts back toward the monastery, crossing the river on a modern bridge and switchbacking up the far side to emerge at Arevatsag (1122 p, till 1978 Nerkin Uzunlar). However, just before leaving the gorge the road passes two steep hills facing one another across the gorge, each garnished with a small fortress/monastery. The right fork in Arevatsag leads to Tsater (928 p), which boasts a church. Chaghatai, the commander of all the detachments of the pagans, heard about the fortification of the city of Lorhe and about the abundance of treasures in it, for located there were the home of prince Shahnshah and his treasury. [Chaghatai] took with him select weapons and many siege machines, and in full readiness he went and settled in around [Lorhe], besieging the city. Prince Shahnshah took his wife and children, secretly went into the valley there and secured them in a cave. He gave superintendence of the city to his father-in-law['s sons] but because they were weaklings, they spent their time eating and drinking and getting drunk, trusting in the strength of the city walls, and not in God. The enemy arrived. They dug at the base of the walls and made them collapse, then settled around them and kept watch so that no one would flee. Now once the inhabitants of the city saw that [the Mongols] had taken the city, they began to crowd with fear and filled up the valley. When the enemy saw that, they started to enter the city and indiscriminately cut down men, women, and children taking their goods and belongings as booty. They discovered the treasures of prince Shahnshah which he had extorted and robbed from those he subdued. [He had] constructed there a sturdy treasury which no one could see, since the mouth of the pit was so narrow that treasures could be cast in, but nothing could be removed. They killed Shahnshah's father-in-law['s sons] and they did reconnaissance around all the fortresses in the district taking many both by threats and by treachery. For the Lord gave them into their hands. Surrounded E, S, and W by the sheer gorges of the Dzoraget and Urut rivers, the N side of the promontory is protected by a massive stone wall with multiple towers. Preserved inside the fortress are two baths, the one on the W edge with complex clay piping inside the masonry. A rectangular roofed structure incorporating various medieval tombstones and Christianized by a couple of flanking khachkars, has no E apse but rather a shallow niche in the S wall facing Mecca, a reminder of Muslim occupation of the fortress till the 18th c. Lori Berd is attested as being inhabited under the Russians, but few traces are left of its recent history. A medieval bridge over the Urut is reached by a steep and winding boulder-cobbled path from the gate, but only one pier base is left of a second bridge over the Dzoraget. Backtracking through Lori Berd, the NE fork leads to Lejan (1722 p) with a 19th c. church on 5th c. foundations. Lejan hosted in 1907 the 3rd Conference of Borchalu Bolsheviks. Agarak (344 p) is an ancient village, with a ruined 5-6th c. S. Astvatsatsin church, a 17-18th c. church, and a fountain monument of the 10-11th c. Near Yaghdan (1996 p) is a medieval bridge and Karmir Khach ("Red Cross") church of the 13-14th c. N up the gorge is Hovnanadzor (421 p, till 1950 Tazagyugh, founded in 1867), with a medieval cemetery in the gorge housing the tomb of Prince Tute (1241). Koghes (107 p) reportedly has a 13th c. church. Karmir ("Red") Agheg (513 p) has traces of an old fort and Aghek church. On the flank of Mt. Shekaghbyur, Mghart (167 p) has a 14th c. shrine. The village and its produce belonged to Odzun monastery in the 18th c. Beyond Mghart, the road joins up with the once-paved, now deplorable N-S road from Odzun to Arevatsagh (one small church in village; W of village on a hill on the L bank of the Dzoraget are ruins of a medieval guard post; Late Bronze/Early Iron tomb field nearby. Just N of Stepanavan, a road angles NE toward Bovadzor (702 p, formerly Maksim Gorki), Urut (363 p) and Sverdlov (1306 p, till 1940 Haydarbek, renamed for the Bolshevik leader). This last has a 6-7th c. S. Gevorg or Grigor church. This road leads to Privolnoye (3100 p), then Khuchapi Vank** =90= (41 11.99n x 044 33.84e) of the 13th c., and then crosses the "Wolf's Gates" pass into Georgia at Aghkyrpi. Khutchapi Vank is situated in a thick forest at the foot of Lalvar Mountain. There used to be a village near the temple with the same name. The massive main church (XIII c) is situated on the S side of the complex, and is fully preserved. From the room to the right of the altar there is a passage which will take you through a narrow stairway in the walls straight up to the roof of the church. The church had 3-m wide vaulted halls on the N & S sides, from which only the half-destroyed walls of the southern one remain. The vestibule took the entire space on the west, and only traces of it remain. Not far from it, lower below, there are half-trimmed stone walls remaining from tower-like two-storied constructions. 25m N of the main church are remainders of the vaulted, one-nave hall. Another small one-nave hall used to stand not too far from the latter one and is considered to be the oldest construction of the complex. The main road follows the Tashir river N, passing Saratovka (969 p mixed Russian, Armenian); a left turn leads to Novoseltsovo (1856 p) with a Russian school and peat bogs. The former regional capital of Tashir (380 p) was founded in 1844 and named Vorontsovka after the Russian viceroy, then renamed Kalinino in 1935 after Soviet functionary Mikhail I. Kalinin, who rose to be Chairman of the Presidium of the Supreme Soviet 1938-46. The Tashir cheese factory used to produced 33% of the USSR's Swiss cheese. Turning E in Tashir, the road leads to Medovka (594 p, old fort nearby) and Lernahovit (1528 p, till 1978 Gharakilisa), with a 12-13th c. church. Turning West in Tashir, a sadly deteriorated asphalt road leads past the villages of Blagodarnoye (1408 p, a Russian settlement once known as Kirilovka); Meghvahovit (496 p, formerly Karaisa); Noramut (till 1991 Gharaghala, with tomb field, an old bridge, caves, and a ruined medieval fort; Katnarat (S of Blagodarnoye) (392 p, founded in 1923 as a horse-breeding Sovkhoz). It then rises into the mountains, crossing a majestic empty upland (closed in winter) of grass and eagles, and eventually descends into Shirak Marz. Back on the main road, you pass Mikhaylovka (295 p, originally Imirhasan, population mostly Russian), and Dzoramut (1753 p, formerly Evli) to reach the Georgian border. A right fork leads to Petrovka (220 p, founded 1920), and Norashen (343 p, formerly Bogdanovka), which boasts a museum. 5 km S is a 6-5th c. BC fort, excavation of which produced weapons and figurines. Beyond Norashen in the hills S of the border are Apaven (832 p, formerly Sarkar), Artsni (54 p, formerly Kizildash), and Sarchapet (1193 p), with a ruined church and fort nearby. On Mt. Lok to the N is an 18th c. pilgrimage site. By-roads NW from Tashir or W from before Dzoramut lead to Metsavan (101 p, originally Ghoshakilisa --"double church", then Shahnazar till 1978), with a 5-6th church and another of the 10th c. There is a ruined fort nearby and a "Tevavor Khach" (meaning: cross with freestanding arms) shrine. W of the village are outcrops of red agate and Acheulian open air workshops. Further W are Dzyunashogh (354 p, till recently Kizilshafak), and Paghaghbyur (369 p, formerly Sovukbulagh -- "Cold Spring"). South from Dzyunashogh or W from Tashir is Dashtadem (2502 p, formerly the Azeri village of Ilmazlu). Vanadzor (93823 p, till 1935 Gharakilisa or "Black Church," till 1992 Kirovakan after Bolshevik Caucasus specialist Sergei M. Kirov/Kostrikov, murdered in 1934 and buried in the Kremlin Wall) is the capital of Lori Marz, Armenia's third largest city, laid out ambitiously in a once-lovely valley now hideously blighted by a huge chemical plant. The plant, privatized in 1999, produced a wide range of chemicals, and also specialized in growing industrial crystals. In 1998, the remaining workers of the plant were using the gas-fired crystal growing boxes to bake potatoes. Vanadzor lost 564 residents in the 1988 earthquake, but preserved most of its grand main street. There is a high-rise hotel with intermittent running water and other amenities in the main square, as well as a number of brand new hotels providing very comfortable and clean accomodations. Vanadzor's history dates back to the Bronze Age, with interesting tombs and other material finds now, in principle, housed in the local museum. The town received its name possibly as early as the 13th c, from a black stone church on a nearby hill. Totally destroyed in 1826 by Hasan Khan during the Russo-Persian war, the city enjoyed considerable uplift from the opening of the railroad to Tbilisi in 1899. In May 1918, General Nazarbekian's outnumbered troops fought the Turkish Army to a creditable tie, pushing them back a few days later at the crucial battle of Sardarapat. On the N side of the Spitak-Vanadzor highway, about 2 km W of the city, there is a little shrine in the ruins of a church, site of a planned monument to that battle. Driving E from Vanadzor on the road to Dilijan, one passes the suburb of Shahumyan (2023 p), the turn-off S for Antarashen (157 v.), the Russian village of Lermontovo (992 p, till 1941 Voskresenovka), Margahovit (367 p, till 1978 Hamzachiman, with 3rd millennium BC antiquities on Sarisop), and the village of Fioletovo (841 v.), founded in the late 1820s by Russian schismatics exiled from Tambov District. The village was renamed in 1936 in honor of Ivan T. Fioletov, an old Socialist activist shot with the other Baku Commissars in 1918. From Margahovit a bad jeep track leads S over the mountain to the gold-mining town of Meghradzor in the Marmarik river valley. An impressively underutilized 11 km (?) rail tunnel cuts through the same mountain. Taking the main road to Alaverdi (most easily reached by staying on the N bank of the Pambak, taking an inconspicuous left at a traffic light rather than crossing the bridge to reach Vanadzor) you bypass the village of Gugark (899 p, Yeghaplu till 1945, then Meghrut till 1983) with a 19th c. S. Sargis church, and then enter the scenic gorge of the Debed River*. Past the turnoff W for Karaberd (372 p), Pambak (395 p) has castle ruins. Vahagnadzor (1110 p, formerly Shagali), has Sisi ruined fortress. A bridge crosses the river to reach Yeghegnut (1413 p, founded 1857, till 1935 Ghamishkut), with S. Kiraki shrine 2-3 km S. Continuing N past Yeghegnut, the road continues to Debed (721 p, founded 1857, till 1935 Khachigegh), Chkalov (972 p, named after the Soviet test pilot, till 1936 Saghibagdi) with 13-15th c. khachkars, and Dsegh, where is joins another E-W road. Dsegh (825 p) was called Tumanyan from 1938-1969, after its famous son, the writer Hovhannes Tumanyan (1869-1923), and maintains the Tumanian house museum. In the village there is a basilica of 654 housing an ethnographic museum, and nearby a 7th c. church built by the Mamikonians, and on the canyon wall almost due N of the village is the evocative, overgrown, semi-collapsed Bardzrakashi S. Grigori Vank* =75= (40 58.66n x 044 39.54e) of 12-13th c, above the confluence of the Debed and Marts Rivers - it may be easier to reach by direct hike up from the spot where the rivers meet at the bottom of the canyon, I have not tested this route but it appears promising. W of the village is Karasun Mankots Vank of 12th c. In a field near Dsegh is the "Sirun Khach" ("beautiful cross") khachkar. One evening in 1898, shortly before the opening of the railway from Tiflis to Kars, we were sitting about on logs before the house of Master Ohanes in a village in the Lori district, having a chat. Master Ohanes was telling us how the construction of the railway had begun. "One day our Simon and I were out cutting wood in the lower valley by the river," he began. "Suddenly we saw several men wearing white caps making their way up the bank." "Well, well, Simon," says I. "Why so? They're just strangers going their way. Perhaps they're lost." "No," said I. "Something's afoot. You mark my words." "When we got back to the village we noticed a white pole on the roof of Tersan's flourmill." "Well, well, Simon!" says I. "Now do you see?" I says. "You wait." I says. "You'll see." Not long after that we saw it announced in the newspaper that the railway was coming our way. "Now do you see?" I says. "I was right, wasn't I?" "So you were, confound it!" cried the hunter Osep, interrupting Master Ohanes' story. "Why, now, what harm is there in a railway?" put in some of the villagers. "Harm, and nothing else! Why, it came hooting into the valleys and frightened away the deer. It's as if they never were," complained Osep. "It's more than the deer, begad," said a shepherd, leaning on his stick. "When I look down into the valley from the mountainside and see them blasting the rocks, my heart bleeds as if my own child were being disembowelled by the enemy and I were standing by helpless...."
"There'll be plenty of destruction alright!" some sighed in agreement. And an argument flared up about the benefit and the harm of the railway. During the argument one of the workers on the railway came up from the valley and approached us. "I need some flour. Will anyone sell me some?" the stranger asked, addressing us all. "Where are you from?" asked Master Ohanes. "I am from the land of the Ottomans." "Master Ohanes, ask him what town he's from, said a curious villager. - "What town are you from, my friend?" Master Ohanes asked again. "From Sivaz!" Master Ohancs repeated wisely, lingering over the last syllable. "What did he say, Master Ohanes?" "May your house stand firm in Sivaz!" cried some of the villagers clapping their hands and laughing. "How many months' journey is it from there to here?" Master Ohanes continued his questioning. "Phew!" they all explained in amazement. "Welcome, stranger! Sit down and do us the honour of eating with us!" "Thank you, kindly but I'm in a hurry. If someone'll sell me some flour I'll be going." "Hey there! Bring out a pot of flour," Master Ohanes called out front the door. "And fill it full!" One of the women brought out a pot of flour and went to pour it into the stranger's bag but he would not let her. "How much do I owe you?" he asked. "Come. Pour it into your bag first!" urged Master Ohanes. "No. First tell me the price." "Go on pour it in, and then we'll tell you. If it's too dear, you can always pour some back." The stranger opened his bag, and the woman poured the flour in and returned to the house. "Right.... Now, how much do I owe you?" asked the stranger pulling out his purse from under his belt. "Nothing, stranger. You owe us nothing. It's all yours for free. In our land we are not in the habit of charging strangers for food. We have no such custom...." said Master Ohanes, puffing at his pipe. The stranger was somewhat embarrassed, protested weakly and left. "A few days ago one of them came for yoghurt. The women offered him some. When he'd eaten it, he stood up and wanted to know the price. 'The price of what?' I ask him. 'Of the yoghurt,' he says. 'My good man, enough of that,' I says. 'Stop such talk or the sheep's milk may dry up.'" Well lads, what is to he done about it then? Are we to let them come and eat and take food away with them as long as they like? How many of them have been coming these last few days? Not so long ago I myself poured out a potful of flour for one of them. How long can this go on?" put in the younger brother of Master Ohanes. "If he comes again, give him another pot...." said Master Ohanes quietly raising his head. "May there always be plenty in your home!" exclaimed some of the old men. "Whoever comes, by thunder, from Sivaz or where have you, should we serve them with food free of charge, as if we work for them! I say welcome! Welcome to all! But if you want food, pay for it then take it!" said the younger brother. And they began to argue. Master Ohanes got all worked up and the din increased. "Toot, toot..." whistled the train down below. The railway had just entered our valleys. From the main road, a turnoff L leads to Vahagni (393 p), with S. Sargis church, Verin Vahagni church nearby. Thence one road leads W to Antaramut, and another N to Dzoragyugh (75 p, formerly Darakend), with fort remains. There it joins up with a road leading W past Hnevank to Kurtan and beyond (see "Along the Dzoraget", above). Just before Dzoraget (279 p, till 1978 Kolageran), with a luxury Tufenkian Hotel (http://www.tufenkian.am), another bridge crosses the Debed to Dsegh and Marts (110 p), which has a khachkar of 1285 above the village. 5 km SE of the village is Igatak, with Igataki Vank of 1255 on the SW edge. A road angles back NW to Karinj (4557 p) and then Tumanian. From Marts, a road follows the Marts River about 12 km to Lorut (482 p, formerly Babajan), with Bronze Age tumuli, two medieval bridges on the Lorut river, a small S. Sargis church, and a medieval settlement with khachkars. Next village E is Shamut (2893 p), which has a 17th c. church and 18th c. fort. Atan (343 p) and Ahnidzor (385 p) at the end of their respective stream valleys were founded in the mid 19th c. by villagers who abandoned the monastic estates of Haghpat. Atan has a church in the village and SW has ruined medieval secular buildings. Just N of the modern industrial town of Tumanian (1705 p), on the W side of the main Alaverdi road, almost invisible in the trees, is the tiny hamlet of Kober, consisting of 45 p About 80m before the elevated little train station, a little paved spur leads up to the right beside the railroad tracks (do not drive under the bridge). Crossing the tracks on foot, a flight of steps leads up and back, finally climbing up steeply up the side of the gorge. The reward for the strenuous (and sometimes muddy) 10-minute scramble is one of the most beautiful places in Armenia, Kobayr Monastery** =95= (41 00.30n x 044 38.10e). The name means cave-cave (Kob meaning cave in Georgian and Ayr meaning cave in Armenian). Perched on a shelf of the gorge, in an ancient and sacred place where springs seep out of the rock, trees and vines twine among the intricately carved blocks of the monastery. There are some difficult to access caves and shelters among the rocks surrounding the territory of the cloister, the most notable of which is the sanctuary of Sghnakh. The Katoghike church at the S end, partly fallen into the gorge, was built in 1171 by two Kyurikian princesses (see Sanahin, below), but became a property of the Georgian Orthodox Zakarian family soon after. Shahnshah Zakarian is buried here. Most of the beautifully carved inscriptions are in Georgian, as is the manner of the splendid (albeit restored) fresco decoration in the churches. The most impressive frescoes were preserved in the apse and on the northern wall altar. The apse paintings consist of 3 rows. The top row depicts the Virgin Mary with archangels, the middle row shows the sin of Eucharist, while the bottom has figures of saints. On the altar walls the figures of prophets are pictured, the best preserved being the prophet Elijah on the northern altar. The side chapel frescos have the same 3-row scheme as in the big church, but instead of the Virgin Mary, the sin of Deisus is pictured. The bell-tower/mausoleum in the middle of the complex was built in 1279 to house the tombs of Mkhargryel and his wife Vaneni. Note the little sacred spring flowing within. On the ledge above is the refectory building. The complex was surrounded with a serf (fortress) wall, the 4-5 m high remainders are preserved on the N & NE. The main entrance was a tunnel-like vaulted opening with half-cylindrical towers. Approximately 3.2km N of Kober train station is a fantastic 45 minute hike (starting at GPS 41 02'01" x 044 38'00", 847m elevation) straight up the canyon wall to your left, ending at the very nice (and very well camoflauged) lower portion of Horomayri Monastery* =85= (41 02.07n x 044 37.66e). There are two main buildings abutting the sheer canyon wall which forms one of the four walls of the structures. Caves, carvings, khachkars, fantastic panoramic views. The remainder of the monastery is a small three chamber structure above the cliff walls, with no access from this section that I could locate, but rumored to be possible to access from a few meters north of the lower section, straight up the cliff. Lord Yovhannes was a learned and holy man, attractive physically and even more so spiritually. [The Caliph] Hisham [724-43] summoned him to court, and honored him greatly for the comeliness of his appearance. Now [Yovhannes] had sprinkled gold dust in his beard [before] he went into [the Caliph's presence]. Seeing Yovhannes, Hisham was amazed at his handsomeness and mildly said to him: "They say about your Christ that he was very meek and humble and greatly loved poverty, The Christian order professes that those who are their leaders honor poverty and plainness more than luxury and riches. Then why are you bedecked so"? The blessed one replied: "You have nothing more than your servant except a crown and royal dress, yet it is for these things that people fear and honor you. Our first Fathers were miracle-workers and undertook wondrous disciplines. For that reason, people who fell into their hands feared them and obeyed their commands with trepidation. But we are not like them; therefore we adorn ourselves in clothes and fashion, so that they will not ignore our commands. Then, baring his breast, [Yovhannes) showed [Hisham] a hairshirt which was worn underneath his clothing. And he said: "This is my dress." The king marvelled and praised the beliefs of the Christians. He said to the blessed one: "Ask of me what you will and I will grant it to you". The patriarch responded: "I ask of you three things which are easy for you to grant. Do not force Christians to abandon their faith, but leave each to his wishes. Second do not make the liberty of the Church subject to you through taxation, take nothing from the priests or deacons. Third, wherever there are Christians in your realm, let them perform their rites fearlessly. Give this to us in writing, and my entire people will serve you" At once [Hisham] ordered that a document be written as requested, stamped it with his own ring, and gave Yovhannes many gifts. He mustered many troops to accompany him, and sent him to Armenia with great honor. When Yovhannes arrived he persecuted all the Greeks in Armenia, both overseers and soldiers. The Greeks fled so quickly that they did not have time to take their treasures with them. So they buried them in the ground, wrote a description of the hiding place, and took the information with them. Beside the church is an unusual 7th c. funerary monument with two sculpted pillars depicting biblical scenes and the Christianization of Armenia. On the NE edge of town is a ruined 7th c. "Tsiranavor" basilica. About 2km S of the village is the black and yellow three chambered chapel on the edge of the canyon wall which is the top structure of Horomayri Monastery mentioned earlier. From the edge of the cliff here to your right can be seen the remainder of the well camoflauged complex abutting the cliff. Just steps to the left (north) of the chapels, there is a spot from which you can descend the face of the cliff. Further S from Odzun is Aygehat (215 p, renamed Danushavan from 1963 till 1992, in honor of its native son, revolutionary and diplomat Danush Shahverdian, who served as Armenian trade representative in Turkey from 1924-28, and then representative to the Red Cross on refugee resettlement), from which a dirt road leads W to Ardvi (778 p). Above this village is a sacred spring with legendary dragon, and beyond that a humble and somewhat cartoony village monastery of S. Hovhannes, allegedly founded by Yovhan of Odzun, with church of the 17th c. The cemetary above has interesting khachkars. Just beyond the Odzun turnoff, a track leads W to Kachachkut (2020 p, formerly Sevdi), which has ruins of a 13-14th c. Sedvu fortress with a well preserved imposing tower, and Sedvu Monastery (aka Sedui Senastan), with a mostly intact S. Nshan church. Further N, in Alaverdi near the Sanahin turnoff, another road winds back W up to Akori (261 p), an estate belonging in the 19th c. to Count Loris-Melikov, successful general and briefly Prime Minister to Czar Alexander, one of the few Armenian members of the Russian nobility. 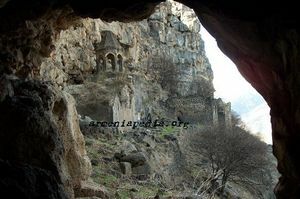 In the gorge SE is S. Gevorg church, and there is the so-called Bgavor shrine somewhere nearby. The city of Alaverdi (14835 p, "Allah gave" in Turkish) owes its existence to the rich copper mines nearby. Systematic exploitation began around 1780, with Greek miners brought in to supplement the conscripted labor of local villagers. The mines benefited the Argutinskii-Dolgoruki noble family, which claimed descent from the Zakarian princes. Members of this family, serving the Czar as military officers or Armenian archbishops, were central to the annexation of the Transcaucasus. At one point, Alaverdi was allegedly the source of one quarter of the Russian Empire's output of refined copper. In the 1880s, the concession was sold to a French company, but the skilled miners remained primarily Greek. The collapse of the Soviet economy has contributed substantially to cutting the once terrible pollution the works generated. FromAlaverdi there are three ways to get up to the village of Sanahin (see below). You can either take the cable car from the Alaverdi post office up the canyon to Sanahin, walk across the 12th century "cat" bridge (by Alaverdi's new church) and take the ancient path, or you can take the road as explained below. After many feats of bravery and triumphs accomplished by the great princes Zak'are and Ivane, they went to the city of Marand, took it, and destroyed the districts around it. Then they went on to Ardabil (Artawil) and similarly took it. Many of the inhabitants together with their prayer-callers (who are called mughri) took refuge in their prayer houses. Zakare ordered that grass and stalks be brought. He had oil and naptha poured on this kindling until [the mosques] were blazing with flames; and he burned [the Muslims] to death saying: "Here are princes and laymen in return for the Armenian princes whom the Tachiks immolated in the churches of Naxchawan, Koran-readers (kurhayk'n) in return for the priests of Baguan who were slaughtered and whose blood was splattered on the gates of the church--a place which is darkened to this day". And Zakare went to his own land. On the way he became ill, for incurable sores appeared on his limbs. As soon as one would heal, another would flare up. He died after a few days of such torments. All the Christians mourned. They took his body and buried it at Sanahin, in the great church beneath the altar on the right side. Great mourning was undertaken by the king of Georgia. Sanahin was the birthplace of Artashes Mikoyants, better known to history as Anastas Mikoyan (1895-1978). His father was a capable but illiterate carpenter at the mines. According to Mikoyan's memoirs, the village of Sanahin had only two literate men, the priest and the (sole) monk of Sanahin monastery. The village itself was impoverished, a holding of the Argutinskii family. Mikoyan was educated at the seminary in Tbilisi at the behest of the visiting Armenian bishop, joined up with Stepan Shahumian, whom he deeply admired, and was the sole survivor of the Baku Commissars, his name somehow left off the list of those to be executed. Uniquely among Bolsheviks of his generation, Anastas survived every purge and change of leadership to become Chairman of the Presidium of the Supreme Soviet, perhaps the most successful Armenian ever to settle in Soviet Moscow. His brother Artyom (1905-1970) was the famous aeronautical engineer, designer of the MIG fighter series. A third brother was killed in WWII. The Mikoyan Brothers House-Museum is downhill from the monastery. Beyond Sanahin, the road continues N to Akner, from which you may be able to reach Kayan Berd, a brooding black fortress built in 1233. Kirakos Gandzaketsi (tr. R. Bedrosian) reports that "Yovhannes, the sister's son of princes Zak'are and Ivane, and the previous Yovhannes' brother's son [was bishop of Haghbat]. This Yovhannes built a fortress with sturdy walls between Haghbat and Sanahin. On account of this fortress, discord arose between the two great monasteries, to the effect that it was on land belonging to Sanahin. Prince Shahnshah, Zakare's son avenged Sanahin, since his father was buried there and he considered it their property, for Haghbat was under the Georgian kings' control at that time. As soon as bishop Yovhannes died, they pulled down the walls of the fortress on orders from the Tatars." The fortress, which sits on a pinnacle above the Debed between Sanahin and Haghpat, preserves the small Dsevanki S. Astvatsatsin church. In the village is an Early Iron Age tomb field. Note that there is another Kayan Berd W of Ijevan in Tavush. Retracing steps across the Debed river, take the main road N, passing the Sanahin bridge, built in 1192. The bridge is elegantly decorated with stone cats. About one km after crossing back to the E side of the Debed on leaving Alaverdi, a cluster of large modern buildings, the transport terminal (? ), marks the turn-off right to Haghpat and Tsaghkashat (956 p, till 1935 Khachidur). Take the left fork which winds up to Haghpat (106 p), with one of Armenia's most beautiful monasteries** =100=(40 54.81n x 045 06.30e) perched atop the rim of the gorge. This fortified monastery was founded, like Sanahin, by Queen Khosrovanush around 976. It has a S. Nshan church finished in 991 by Smbat Bagratuni and his brother Gurgen, and served as the religious headquarters of the Kyurikians. The gavit was built in 1185, with the following inscription on the N facade: "In the year 634/AD 1185, I Mariam, daughter of King Kyurike, built with great hope this house of prayer over our tombs -- those of my paternal aunt Rousoudan, my mother Tamara, and myself, Mariam, under the superior Ter Barsegh, archbishop, who finished the construction. You who enter through its door and prostrate yourself before the cross, in your prayers remember us and our royal ancestors, who rest at the door of the holy cathedral, in Jesus Christ." A smaller S. Grigor church was built in 1025 and rebuilt in 1211. There is a huge, self-standing gavit of the Abbot Hamazasp built in 1257, a "grand and marvelous bell tower" of 1245, and a library built in 1262. There is a large dining hall incorporated in the defensive wall, and several other picturesque chapels and mausoleums. Haghpat was a major literary center in the Middle Ages. It controlled the income and inhabitants of numerous villages and lands, gradually usurped by the Russian state and influential Armenian bureaucrat/princes during the course of the 19th c.
In the late 18th century, the Archbishop of Haghpat claimed responsibility for the clergy and church revenues of all the Armenians of Georgia. This Armenian community grew rapidly with the Russian expansion into the Caucasus, particularly refugees who followed the Russians in retreat from Karabakh in ? and Yerevan in 1804. The Russian governor Tsitsianov, an imperious and somewhat anti-Armenian Georgian prince, unilaterally transferred this authority in 1805 to the Armenian archbishop in Tbilisi, a pro-Russian ecclesiastic it was easier to keep an eye on. The Archbishop of Haghpat, Sargis Hasan-Jalalean, scion of an ancient family of meliks of Karabakh and brother of the late Katholikos of Aghvank, protested in vain, noting that his brother had been killed and he himself imprisoned by the Khan of Karabakh as a result of their friendly correspondence with the Russians. Archbishop Sargis eventually moved back to Karabakh to become in 1810 the last Katholikos of Aghvank. This Katholikosate, founded (Armenians say) by the grandson of S. Gregory the Illuminator, controlled the religious affairs of the Caucasian Albanians, the pre-Turkic population of what is now Azerbaijan. During the Middle Ages its geographic basis shrank and it became culturally assimilated to the Armenian church. In the 18th century it was a near-exclusive family holding of the Hasan-Jalanean family, operating out of the monasteries of Gandzasar and Amaras in Karabakh. The Russian Empire abolished the Katholikosate of Aghvank in 1815. Neghuts (536 p, formerly Gomahand) has khachkars and, in the cemetery, 3rd-2nd millennium BC cliff carvings. To reach the impressive 13th c. monastery* and fortress* at Akhtala =95= (41 09.13n x 044 45.83e), proceed left over the Debed on an unsignposted bridge to an industrial appendage of Akhtala (14322 p). Turn right at the end of the bridge, then after 0.4km the road takes a hard left, crosses the train tracks, and splits - take the right fork over a small tributary stream. Proceed 0.3km ahead to a crossroads; turn sharply (almost a U-turn) to the left. Proceed 2.2km up this road, passing a soviet-era apartment building on your right at 0.5km and passing a bridge to the left (stay on the road to the right) at 1.6km. As you approach the end of these 2.2km you will see the fortress on the left; proceed past it until the road turns sharply right and a small dirt road continues straight and then to the left. Take this small road 0.3km to reach the fortress gates. 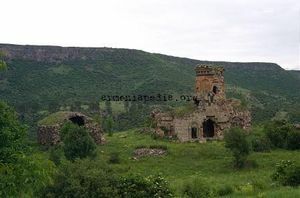 The Akhtala fortress contains an Arakelots or S. Gevorg church and two more W of it. Also, a 13th c. spring monument. It is surrounded with rocky deep canyons on three sides, and the north side joins the plain. The fortress is protected by tall pyramid gates and by man-made extensions to the three canyon walls. Although the inside of the fortress appears to be flat earth, much of the edge is built up and contains subterranean rooms. Use caution, specially with small children, as there are a few holes than can be as much as 12 feet deep into these rooms. The main entrance opens on the northern side, which has a roomy hall with vaulted roof and a three-storied pyramidal tower. The fortress was built in the X c by the Bagratuni dynasty's Kyurikid branch. Being one of the outstanding defensive spots of medieval Armenia, together with Lori, Kayan, Kaytzon, Gag and other fortresses, Akhtala played a great role in protecting the northern regions and the main road taking from Armenia to Georgia (through Gugark). The Holy Virgin's church is famous for its first-rate and highly artistic frescos, with which are covered the inside walls, the partitions, and the bearings. They are characterized with perfect iconography, richness of theme and variety of different colors (where blue rules). Especially outstanding are the Virgin on a throne, the sacred communion, Hovanes Karapet frescoes, as well as pictures of saints till the waist or standing in whole length, on the pillars and the bearings. Find a villager to help unlock the church door in case nobody is around. On the northwestern side of the Holy Virgin Church there is a one-nave vaulted church and its half-rounded apse going out from the eastern wall's borders. The only entrance is from western side, surrounded with a trench. There used to be a vestibule with a gable roof, which has not survived. Parallel to the north of the Holy Virgin's church the two-storied building of the friary stood, whose walls are preserved. It was a roomy hall with wooden roof, for which the exterior fortress wall served also as its eastern wall. The northern wall is half-rounded, and an entrance to the underground tunnel opens here. 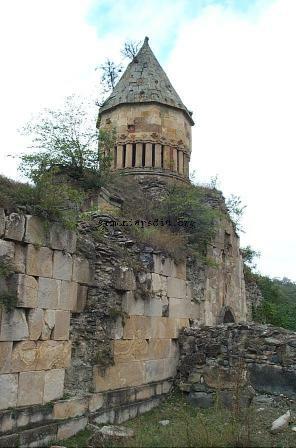 Beyond the territory of the temple in Akhtala village, there are many churches, chapels, and defensive erections standing or destroyed (X-XIII cc). 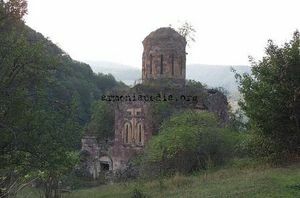 Among them are temple of the Holy Trinity (consisting of two connected churches, a chapel, outside hall, and underground constructions), St. George church, the pair of churches in the western part of the temple the chapel of Barsegh, etc., which in their turn evidence Pshndzahank-Akhtala's medieval eventful (rich) past. The monastery complex's main entrance and the pillars were repaired; the ramshackle wooden belfry built in XIV was taken away from the yard. In 1975-1978 the top parts of the walls on the church were repaired, the tin of the roof was replaced with basalt slabs. By the village was a large Early Iron Age cemetery. In 1763, King Herakli II brought Greek miners to work the ore deposits nearby. Upper Akhtala has a Greek church. A road W from Akhtala leads to the copper mining town of Shamlugh, (13592 p) whose deposits have been worked since ancient times (Late Bronze/Iron Age cemetery, one 13th c. cross monument). From Akhtala, another road runs N on the W side of the Debed to reach Mets Ayrum (1948 p), with a Nahatak (martyr) shrine of 1612 4-5 km NW. Chochkan (477 p), the next town NE, was an estate of the Loris-Melikov family, and has a church built by the Count's mother. There is a Shportavank of the 17th c.; W of the village is a cliff called Timurlenk's stone. Last village before entering Tavush and Georgia is Karkop (200 p, founded 1936). Back on the E bank of the Debed, Shnogh (234 p) has on its territory various traces of metal-working sites from ancient times. In the village is an ethnographic museum. On a triangular promontory above the Debed is Kaytson Castle, probably founded in the 9th c on the remains of a cyclopean fort. 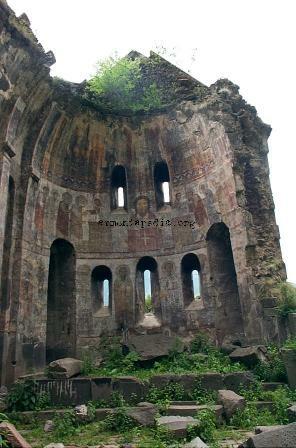 There is a ruined single-aisle church, S. Gevorg church of 1893, the Terunakan shrine of 1222 E of the fort. From Shnogh, a road goes 4 km S to Teghut (1201 p) and its 13th c. Manastefi hermitage, 10-17th c. churches, and a 13-14th c. Vardan Zoravar monument. Tucked into an inaccessible corner of N Armenia, reachable (the map says) only from the Georgian town of Opreti, the village of Jiliza (1374 p) has on its territory a 13th c. ruined fort and shrine and, in deep forest at 1300 m elevation somewhere on the W slopes of Mt. 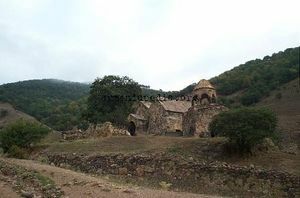 Lalvar, the architecturally unique Khorakert Monastery* =90= (41 12.53n x 044 36.00e). The 11th or 12th c. domed church has a 12-faceted, columnar drum. The gavit was built in 1252 in the days of King David of Georgia by Hovhannes Varnetsi's son Stepanos. There is a ruined fortification wall, dining hall and, south of two little shrines, (near the wall, amidst trees) remains of a covered passage leading into the gorge. The monastery was restored in 1661 and 1710, but was already in ruins at the beginning of this century. The artistic and structural shape of the cupola is unique not only in Armenian but in world architecture. The drum of the cupola has a decahedral shape, rare in Armenia. which cannot but draw special attention to it. The facets are made not of the usual walls, but composed in the lower half out of hexahedral columns, three per each facet. Identical capitals and bases, having beads and hexahedral plates, are original. Spanned with trefoil and quatrefoil conchs, the spaces between columns serve as light openings. This extremely bold treatment of the drum as a colonnade is not to be found in other monuments. The cupola of Khorakert temple is an intermediate link between ordinary cupola and multi-column rotundas used in bell-towers. The inside of the cupola is also most original. The constructive basis of its hemi-sphere is made up of three pairs of intersecting arches which form a six-pointed star. The central hexagonal section is filled with stalactite-shaped ornaments differing in their delineation, size, and height as if forming another, more graceful and more richly ornamented hemisphere. This is the only such design among church buildings. The vestry attached to the temple in 1257 is a rare example of a building rectangular in the plan and roofed with a system of intersecting arches spanning the entire hall. A major E-W road and rail route, mostly in good shape, leads from Spitak to Gyumri, following the Pambak river. North of the road are Shenavan (213 p, till 1946 Kiziloran, Azeris), with a cave and a ruined 6-7th c. single-aisle basilica nearby; Sarahart (412 p, till 1950 Gyullija), with two churches, and ruined hamlets 6 km N.; and Gogaran (1798 p, till 1946 Gyogarchin or perhaps Gyoran), which had ruins of a 17th c. church, and the Sangyot fort nearby. Beneath the ruins of the 17th century church were found the foundations of a 5th century church according to Land and Culture Organization which was completely rebuilt during the 1990's by a team of villagers as well as volunteers from the diaspora. The church was reopened in 1996. The villagers can direct you to a large, beautiful waterfall a few hours hike (or quick drive) from the village. Before Geghasar (4739 p, till 1978 Tapanli), you pass early cave dwellings near the road (5,000 years old according to Patrick). There is a 19th c. S. Sargis church in the village. Astvatsatsin shrine is 2 km distant. On August 25, 1807, Karapapakh nomads who used to live there descended on the Armenian settlers and decapitated several, according to a report to General Gudovich. Shirakamut (131 p, Nalband till 1978) was the epicenter of the 1988 earthquake, with 313 killed. The 7th c. Chichkhanavank N of the village is now a pile of stones. Some 3rd millennium BC graves have been explored nearby. Other villages, from East to West, are: Katnajur (212 p, till 1946 Gharal); Mets Parni (66 p, in 1807 site of a Russian military post called Bekant, then Beykend, then Parni Gegh), with a 19th c. S. Sargis church; Tsaghkaber (1689 p, till 1939 Avdibek); Saralanj (495 p, till 1946 Gyogoghush); Hartagyugh (258 p, till 1946 Ghaltakhji) with a 19th c. church and, 1 km S, a S. Hovhannes shrine and pilgrimage site; Lusaghbyur (1216 p, till 1946 Aghbulagh, ruined church); and Khnkoyan (270 p, till 1946 Gharaboya), birthplace of children's writer Khnko Aper, site of his house museum. The road then crosses the watershed into Shirak Marz. 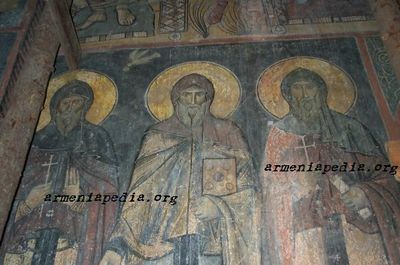 A huge number of Armenia's monasteries were built or rebuilt under the auspices of two brothers, the generals and protectors of Queen Tamar of Georgia, Zakare the Amirspasalar (roughly "commander in chief" in Arabic/Persian) and Ivane the Atabek ("prince's tutor" in Turkish). The origin of the family are obscure -- Kurds by one medieval account, mid-level Armenian lords by another -- but their successful generalship was indisputable. In a series of campaigns from the 1190s to 1220s, they freed Georgia and most of historical Armenia from the Seljuk Turks and reestablished Christian control of the region. Zakare was Armenian Gregorian by religion, his brother Ivane Georgian Orthodox. They were pious, and made sure to record their numerous benefactions in inscriptions on stone. The almost permanently victorious Ivane was ultimately defeated near Garni by Jalal ad Din Mingburnu, the last Khwarezm-Shah, in 1224 (allegedly the Lord of Battles caused his troops to hear the order "Flee!" instead of "Attack!) and died shortly afterwards. The Khwarezm-Shah was himself on the run from forces beyond his control. When the Mongols arrived in 1236, both Zakare's son and heir Shahnshah ("King of Kings" in Persian, a lovely example of the common Armenian use of titles as personal names) and Ivane's son Avag ("Senior") reached fragile and unsatisfactory accommodations with the new world rulers, but they and their descendants held on to substantial fiefdoms until the onslaught of Timur and his hordes.